I need you to stop what you are doing and listen to this glorious announcement that has just came to our favorite Donut shop in Daytona Beach. Krispy Kreme has delivered us delicious news and for a limited time has released three new delicious donuts! Let's have a date. · The NEW Snickerdoodle Doughnut is a cake doughnut rolled in cinnamon sugar, drizzled with white icing and topped with snickerdoodle cookie pieces. 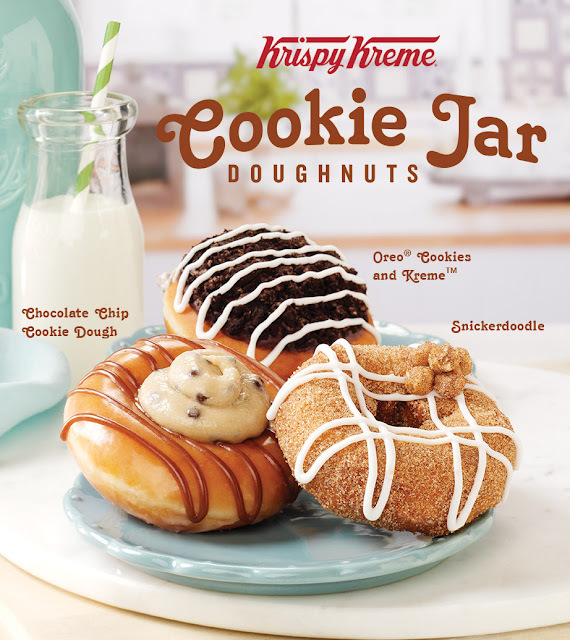 · An indulgent take on a classic, the Chocolate Chip Cookie Dough Doughnut features an Original Glazed® doughnut topped with milk chocolate drizzle and a cookie dough flavored Kreme™ dollop. · The Oreo Cookies and Kreme Doughnut is filled with a decadent Oreo Cookies and Kreme filling before being dipped in dark chocolate icing. The doughnut is topped off with Oreo cookie pieces and white icing. · Plus, the Oreo Chiller, blended with Oreo cookie pieces and topped with whipped cream, Oreo cookie pieces and a chocolate drizzle, is available at all Krispy Kreme shops in Central Florida. Share your sweet treat using #KrispyKremeCookieJar.